Investigating the Dreaded "Click of Death"
A friend of mine had a nice portable 1 TB external drive, an iOmega unit with a SATA Hitachi disk inside. It began to exhibit what is known as the "Click of Death", a rhythmic clicking (and beeping in this case) accompanying the failure to function. The disk unit itself could not detect the media, so the operating system would see a USB mass storage interface with no media. In the interest of investigating, I started by removing the panel at the end with the power and data connections and the power switch. Remove two small screws and lift off the end panel. Then you can look into the end of the case. My friend had gotten this far, reporting that he could see no loose connections. He said that he could not see how to further disassemble the unit, and told of what he described as a strange "gyroscope-like" feel. To me, it was not a self-stabilizing gyroscope feel, but a vibration as if the platters or motor were somehow out of balance. Removing two small screws and one end panel. Looking into the end of the case. Notice the two rounded tabs within the rounded sides of the case at the far left and right. We will use those to remove everything from the outer case. The trick is to push against the two small tabs that the two screws thread into. As you push, the plastic panel at the other end will start to come out of the case. It will be followed by the rest of the unit. A carrier frame is made up of two aluminum pieces running almost the entire length of the case. This frame holds the disk and the USB interface card. Pushing the frame out of the case. 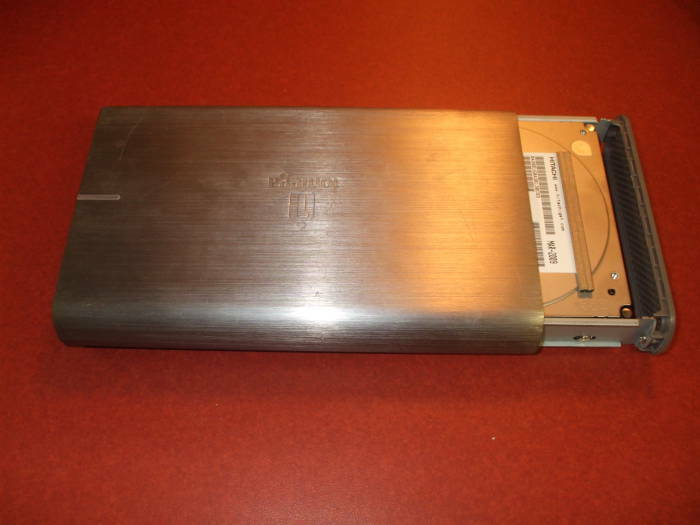 The disk and USB interface, on the carrier frame, are removed. Here you see the unit taken apart into its major components. 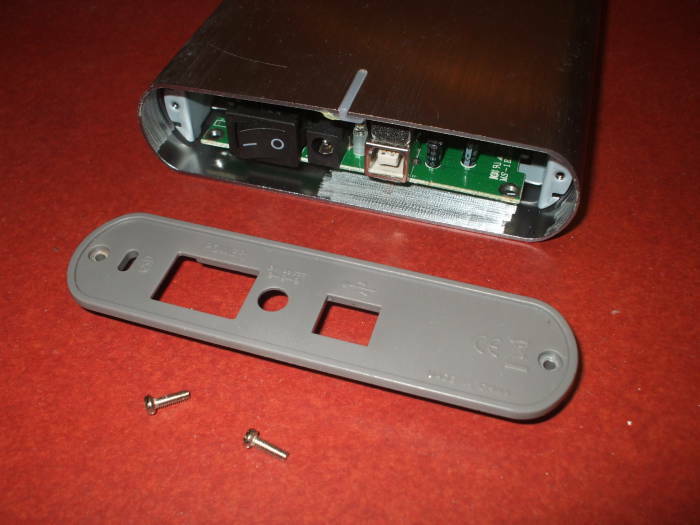 Left to right, the removable end panel, the outer case, and the disk and USB interface on the carrier frame. SATA controller on the disk, and SATA-USB interface. 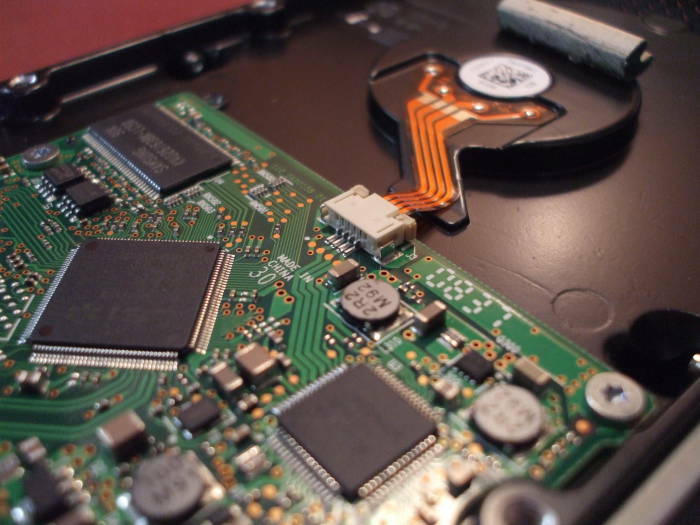 A small circuit board provides the power needed for the disk (5V at 420 mA and 12V at 700 mA, derived from a single 12V DC external supply) and the interface between the disk's SATA interface and the external USB interface. Turning it over we see the power supply and USB-to-SATA interface card and its direct connection to the disk's drive electronics card. 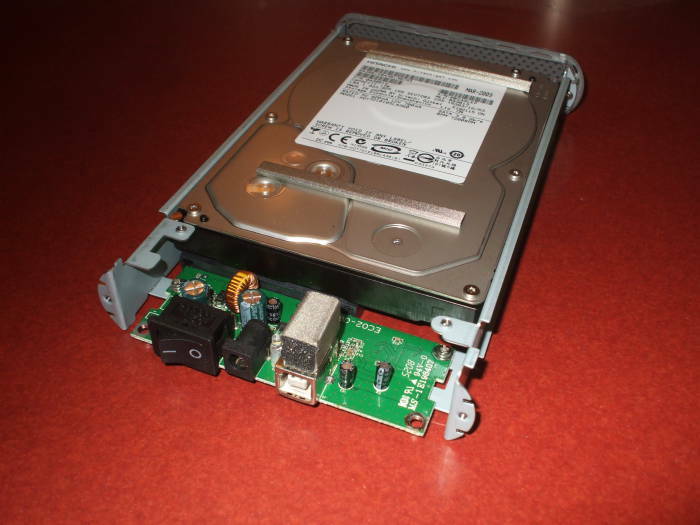 Connection between the disk and the power supply and SATA-USB interface card. 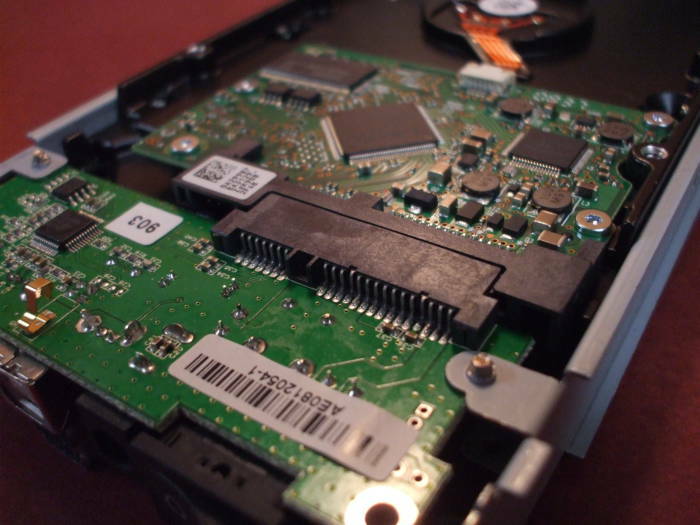 Connection between disk and the disk controller and SATA interface card. 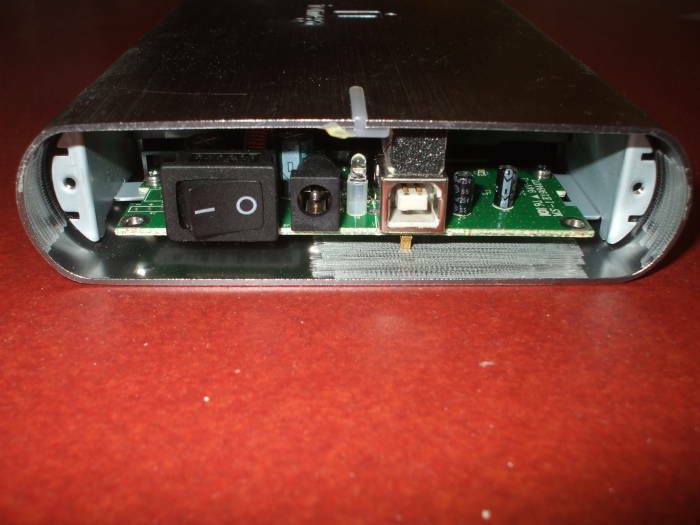 I had initially considered the possibility that the sharp blow at the end of the fall had partially disconnected a connection between the USB interface card and the disk itself. However, both are sturdily connected to the carrier frame, and the connection is quite permanent. You would have to remote two screws, seen here projecting up through the circuit board and tabs of the frame, before you could pull that USB interface card back and break any of the connection. 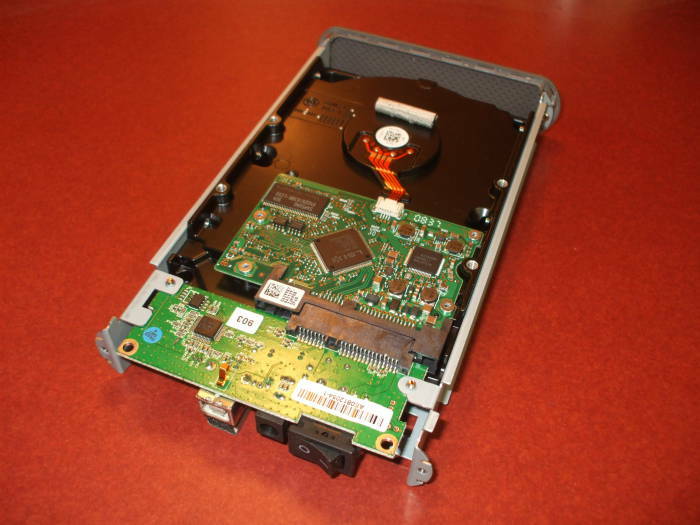 The original manufacturer of the disk, Hitachi in this unit, made the circuit board with the disk controller and the SATA interface. That connection is also secure. It is a miniature Molex connector that snaps into place. Disconnecting this requires manipulating a plastic latch that has snapped into place while simultaneously pulling the plug out of the socket. We eventually decided that the drive was beyond repair. He had a backup, so little data was lost. 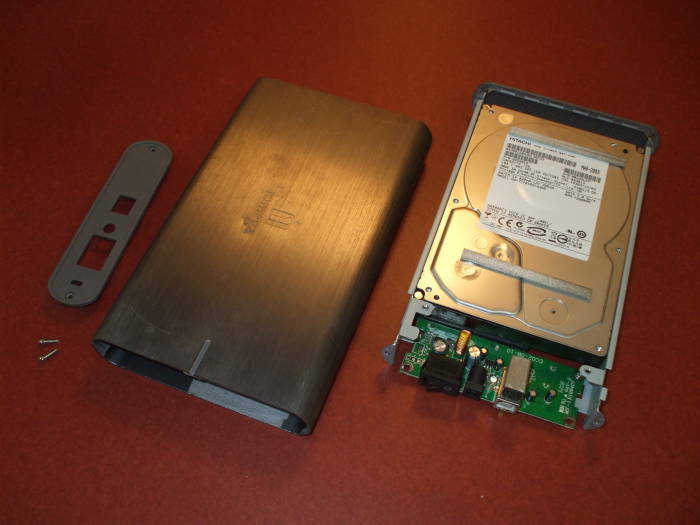 Here we have removed the disk cover. 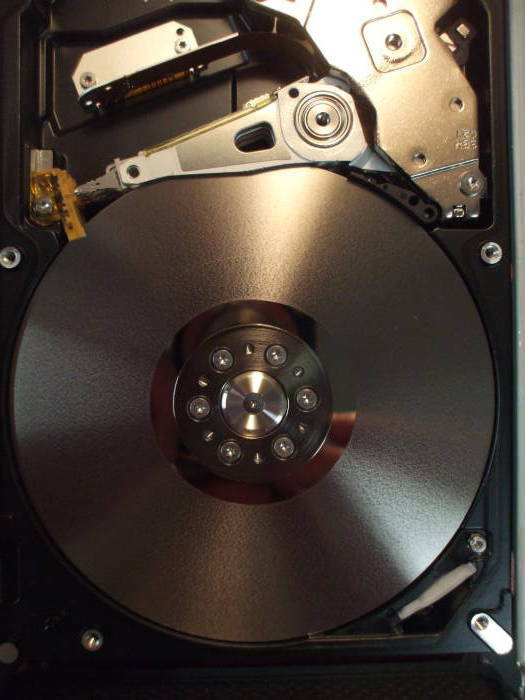 Do not do this unless you either are certain you are working in a very clean environment and you know how to keep the disk clean and seal it back up, or you no longer care about data recovery. This requires a small Torx drive, and you have to lift a sticker to access one of them. Removing the cover and exposing the disk platters. 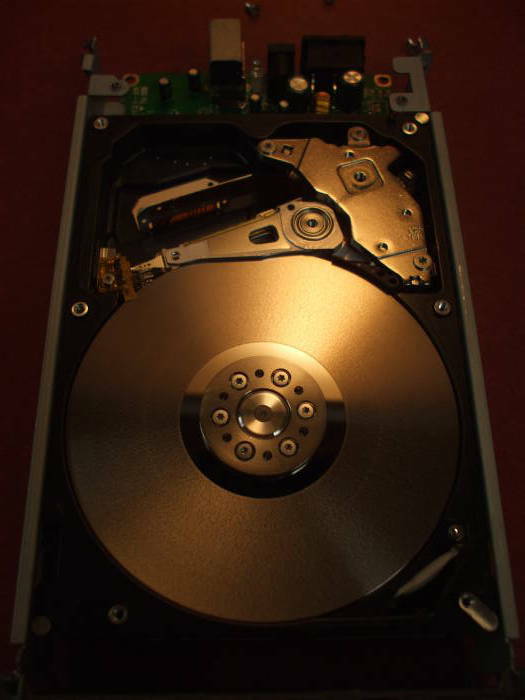 Exposed disk platters, heads and arms. The arms carrying the read/write heads retract completely off of the platters and are parked when the disk has been powered down. The platters spin easily with no indication of imbalance. However, this drive spins the platters at 7200 RPM (at least when it is in good working order), so the slightest of imbalances will be significant. Here is the interesting part, the behavior of the arms causing the distinctive "Click of Death." The clicking is mechanical, caused by the armature traveling all the way to its mechanical stops in both directions. This is accompanied by an electronic beeping, coming from the SATA-USB interface card as the attached disk repeatedly returns error events. The arms travel all the way in, return all the way out and strike the stop to make the click, and the interface card makes a BEEP to indicate "no media detected". Video of the Click of Death.